Part of the Children's Work ~ Various series. The value of teaching the Scriptures to children can be seen in what we know of Timothy’s life and ministry as detailed in the New Testament. We are told that “from a child” he knew the Holy Scriptures (2Tim 3:15). As a result, he was saved and later involved in the work of the Lord, even as Paul (1Cor 16:10). We read in Acts 16:2 that he was “well reported of by the brethren,” and Paul commends his character and work in various letters – a real asset to the work of the Lord. Such potential sits, squirms, or fidgets in front of every Christian seeking to reach the young with the gospel in the various children’s outreaches available. This work then is both a great privilege and a great responsibility for those who are involved in it. Let’s look at the individual the Lord would use in this work and consider the prerequisites and preparation for teaching children. The children’s worker shares many qualities with the evangelist. 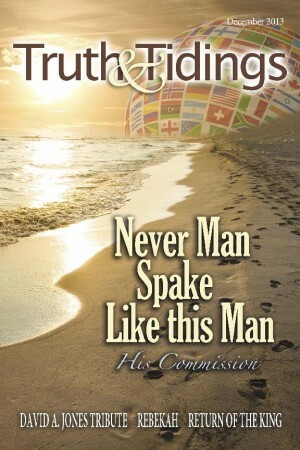 Namely, a person who has experienced God’s salvation himself, has a burden to see others saved, and someone obedient to the Lord’s commission: “Go into all the world and preach the gospel to every creature.” He is willing to make sacrifices to reach others with this message, showing care and concern for the lost (1Thes 2:7-9). Unlike the disciples in Matthew 19, the children’s worker recognizes the value of bringing young ones to the Lord, and is willing to spend time with them with a view to winning them for Christ. We can take from this passage (vv13–15), and the parallel passage in Mark 10:13-16, that the children were willing to be with the Lord and were gladly taken up into His arms. This teaches us that the more we are like Christ, the easier it will be to attract and effectively reach children for the Lord. Christlikeness is God’s purpose for every believer (Rom 8:29) and is a work of the Holy Spirit (2Cor 3:18). However, it’s not something that is accomplished without the involvement of the individual, nor is it something that takes place overnight. There needs to be that “exercise unto godliness” mentioned in 1 Timothy 4:7. Spending time in prayer, in reading and studying the Scriptures, and in meditation, allows opportunity for the Spirit to do His transforming work in us. The more consistent we are at using our time this way, the more the Spirit can work. Most have heard brethren use Leviticus 16 to teach the importance of going into the presence of the Lord first, before going out to do service. This principle applies to us all and needs to be practiced by those who would effectively teach children the Scriptures. In addition to Christlikeness, there are other prerequisites to consider. Paul confirms that a child’s understanding and thinking differ from those of an adult (1Cor 13:11). Therefore, the approach in presenting the gospel must, of necessity, be different as well. As with any service for the Lord, He is the One Who fits the worker for the work. In Exodus 4 we read of Moses’ reluctance to go to Pharaoh with the Lord’s message. He cites the fact that he is “not eloquent” and that he is “slow of speech and of a slow tongue.” The Lord had to remind him that He was the One Who had made him the way he was. The Lord made Moses the man he needed to be in order to do the work He had called him to do. Similarly, today, the Lord appropriately equips believers to be used in reaching out to children. This would include the individual’s personality, a love for children, and an ability to communicate truth in a simple way. The Lord often blesses the person with creativity, an asset which enables resourcefulness in determining suitable means of reaching specific age groups. Just as Paul fitted his gospel approach to his audience (1Cor 9:20-22), so the children’s worker needs to suit the lesson to the understanding of the children being taught. The Lord also uses life’s circumstances or specific experiences over time to teach other qualities necessary for effectively teaching children. The skill to maintain interest and engage the children in the lesson, and the ability to maintain order and discipline in the group are both traits that are usually developed over time. Since most children’s work is carried on by a number of believers working together, newer or younger believers are able to learn from more experienced workers. Choosing to spend time helping with ongoing children’s work is one way to prepare for teaching children. Another is to take time to observe and interact with children in different settings. This will give insight into how they think and process information – valuable knowledge for any seeking to teach the young. This of course is easiest for those who are parents raising children of their own, or for those in the teaching profession. However, opportunities to gain this insight are available for others who are exercised as well. A fundamental preparation for any children’s worker is to become familiar with the Scriptures. Bible stories, Bible characters, and specific doctrines that can be presented in a simple way are all solid bases for lessons in teaching truth to children. There needs to be that knowledge of truth from which to draw in order to pass it on to others (2Tim 2:2). We speak out of the abundance of our heart (Luke 6:45). The more familiar the Scriptures are to us, the more they are an integral part of our lives, and the more natural it will be for us to convey the message to others. The blessed man of Psalm 1 delights in the law of the Lord. He meditates in it day and night, and prospers in all that he does – an excellent model for any the Lord would use to effectively teach children the Scriptures.